The presence of ancient tombs is no surprise for an average Delhiite. The city is dotted with them, right from those of kings ~ Humayun and Safdarjung ~ to a scattering of unknown ones that form roundabouts or abut on to roads. But a whole garden of medieval era tombs, that too in the heart of the Capital, would come as a surprise to many. And that is what Sunder Nursery is, though its name is really a misnomer. 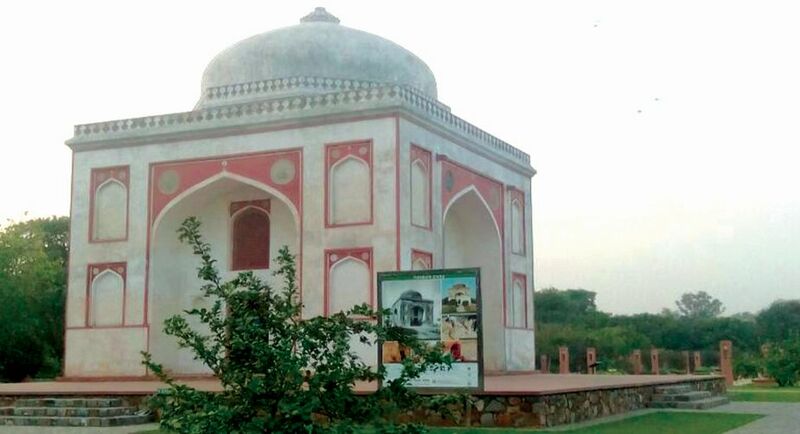 A curated walk, conducted by the Aga Khan Trust for Culture (AKTC), which has restored the 90-acre Sunder Nursery, located adjacent to the Humayun’s Tomb, took a group of women scribes from the Indian Women Press Corps (IWPC) through a city park that is new yet replete with heritage. Restored tombs and newly-laid walkways are embellished by natural landscape as also well-designed park areas and a profusion of flower-beds. 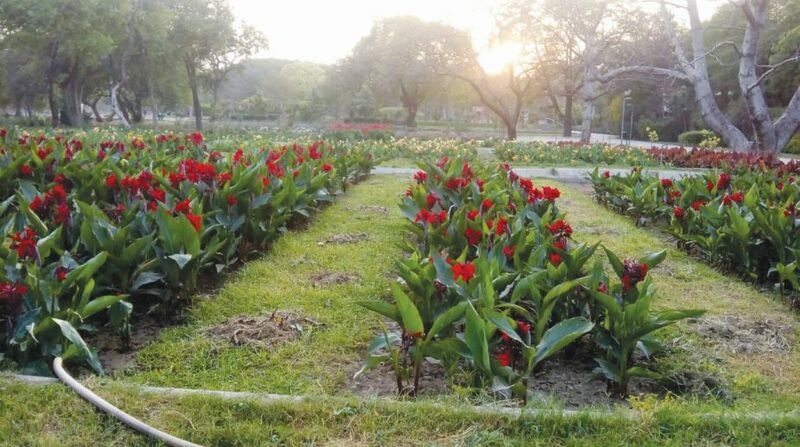 The reason there are gardens in this park is that, unlike Lodhi Gardens, where there were villages that were vacated to create the gardens, Sunder Nursery was built as a garden. All the way, from the Humayun’s Tomb to the edge of Purana Quila, is basically a garden that has now been restored. According to AKTC, from the 14th century onwards, the Nizamuddin area has seen a profusion of building activity. Serais, tombs, baolis, mosques, lofty gateways and garden pavilions have all been built along the River Yamuna. In the 16th century, the Grand Trunk road was built through the area, which encompassed several garden tombs, including that of Emperor Humayun. By the 19th century, the area stretching from Purana Qila at its northern edge and Barapulla at its southern edge ~ the first Mughal city of Delhi ~ was being used for agriculture. It was in the early 20th century, during the building of the capitol complex of New Delhi, that Sunder Nursery was established north of Humayun’s Tomb. It was created to propagate saplings for New Delhi’s avenues and experiment with plants brought from other parts of the British Empire. In the 1940s, the Central Public Works Department acquired the nursery and continued to use it for field trials of different tree species. In the run-up to the 2010 Commonwealth Games, Ratish Nanda informed, there was a proposal to build a road right through Sunder Nursery to connect National Highway 24 to Lodhi Road, which marks the edge of New Delhi, so that there would be easier access to the renovated Jawaharlal Nehru Stadium. Fortunately, that was averted. Following a 2007 Memorandum of Understanding (MoU) with the Central Public Works Department, the Archaeological Survey of India and the South Delhi Municipal Corporation, the AKTC commenced conservation and landscape works at Sunder Nursery. Part of a much larger urban conservation project, which includes the Humayun’s Tomb and the Nizamuddin basti, the conservation work was in line with several other projects that AKTC has done world over ~ Cairo, Kabul, Zanzibar, Lahore, Mali, Chantilly near Paris and Canada. “This is a typical combination ~ one is the heritage site, the second is resident population, which can benefit from the conservation effort we undertake here. And the third is creation of a city park,” explained Nanda. The Nursery will eventually become a city park with distinct heritage, ecological and nursery zones, as well as all the expected facilities. Conceived by renowned landscape architect Mohammad Shaheer, the Nursery has been divided into zones to mimic Delhi’s micro-habitat. “Delhi has the plains, but it’s also got the Ridge,” pointed out Nanda. The Ridge is bound by water bodies. So, there’s a river landscape and also a marsh that is fed by the spin-off water from the sewage treatment plants. This also attracts birds, which nest on the trees, on the ground, in the marshes or burrow in the ground. 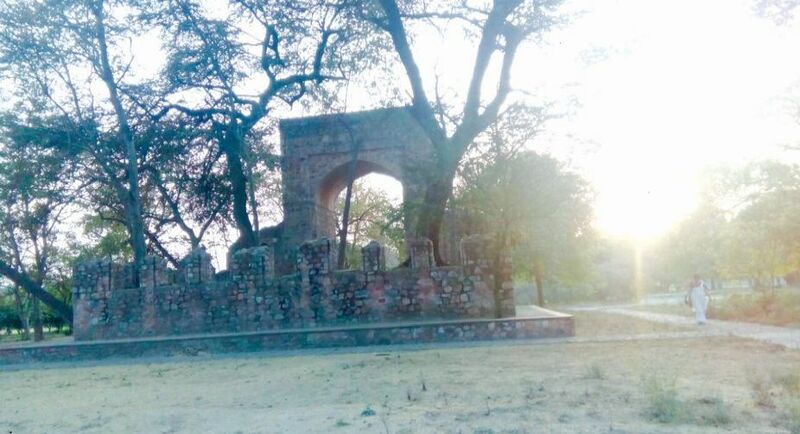 In 2016 AKTC was able to get six of these monuments on the World Heritage list ~ Lakkarwala Burj, Sunder Burj, Sunderwala Mahal, Mirza Muzaffar Hussain’s Tomb, Chitra Batashewala and an unknown Mughal Tomb ~ and 12 others in the complex. However, little is know about who built them. “Since this was part of the project, we’ve restored or conserved about 50 monuments,” informed Nanda. “Over time, what we were able to do was demonstrate that Humayun’s tomb’s significance lay in the fact that it’s an ensemble of gardens and not just an isolated building. We were able to expand the World Heritage site from 20 acres when we started to 200 acres.” In the whole Nizamuddin area there are about 100 buildings, he added. A Nature Trail, Heritage Trail and place for recreation is what is now offered. We were first led to artificial mounds that were created to resemble the Ridge landscape, though on a small scale. Giving it a natural look, the once barren land has been rejuvenated with over 280 species of plants and trees. It is now teeming with bird population, with some 80 avian species identified apart from 60 butterfly species. Though snakes have been spotted, a reptilian survey is yet to be conducted. Over the last decade about 1,000 truck-loads of construction rubble was removed from this area and 20,000 saplings planted. Even dead trees have been retained because of their ecological importance. “This is the only garden where you will see a lot of birds such as the Grey Hornbill,” Nanda pointed out. Around 4,200 trees have been mapped on GIS and by the end of this year this will be put on a phone app, he added. The groundwater in the area has gone up significantly, though being close to the Yamuna it was not really an issue. Twelve wells were found in the garden. Filled up with rubble, the wells, which are Mughal contemporary, have now been restored. A lake has been created at the bottom of the garden. It acts like a water reservoir. Then there is a big amphitheatre, which also acts as a water reservoir. An underground tank also collects about 3 lakh litres of water. Also, the Ridge’s run-off collects in the water body. The marshy area will be planted with water-loving plants. “This is all connected to the environment and will also attract birds,” Nanda noted. We then came upon a beautiful 18th century building, the Garden Pavilion which was found in a highly dilapidated condition. The tunnel road that was proposed by the Delhi government was to run through this portion and the pavilion was in such a state of ruin that it had no value and was marked to be razed down. “It took us months figuring out what it was,” recalled Nanda. “It was in such a state that it was almost microscopic archival research. This was exactly like this, including the jallis. It’s new but it’s an 18th century building.” Expanding upon the conservation work, he said nothing is done without evidence or through conjecture. We walked on to a small amphitheatre, where the children can be gathered and given a talk. But it is also part of the water body, which will be functional during rains. Portions of this area are concrete but there are large portions which are just earth, with plants and grasses that grow along the river. Moving away, we were awe-struck by a huge structure that at first sight looked like ruins. This, Nanda told us, was the Grave platform. Basically, a tomb itself is “unislamic”. In Islam the burial site is supposed to be covered only with earth and grass. But then people started building tombs. This platform was for the graves and the arch symbolised the mosque. Nanda had photographed the structure in 2001 for INTACH. But when the current project started in 2007, the building had collapsed. An early 16th century serai is located on the other side the boundary, inside the zoo. However, AKTC is conducting conservation work on the serai, which was once located along a 16th century Grand Trunk Road that once passed through the Nursery. It’s again a protected monument, which is 16th century. Recalling the conservation effort that went into restoring the building, Nanda said a lot of cement had to be removed and lime mortar coating given. In the 20th century, he explained, almost every historic building anywhere in the world was treated with cement. In the 1980-90s, people started to realise cement is more harmful than leaving the monument alone. 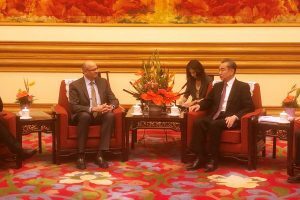 “The good part is after all that effort, these buildings have been designated as World Heritage sites, which is the highest form of recognition for heritage value,” he added. A beautifully restored building, the Nursery gets its name from this building. The calligraphy on the outer walls and inside is original that has been restored. The panels on the inside have a very distinct geometric pattern, which one can make out after minute observation. “It’s amazing how the craftsmen were able to do this so long ago,” Nanda said. A beautiful 16th-century geometric pond, it was initially thought to be a well. Just over a metre in depth, this 9-metre diameter pond was designed with eight petals on its edges. Its shallow depth and depressions on the base showed that this was a lotus pond. The restored pond is part of the central axial spine along which gardens and flower beds have been arranged. This central vista, over 500 metres long, follows the path of the 16th century Grand Trunk Road, connecting the entrance zone of the Humayun’s Tomb World Heritage Site with the Azimganj Serai to the north.